Visit our website at mohumohu.com! 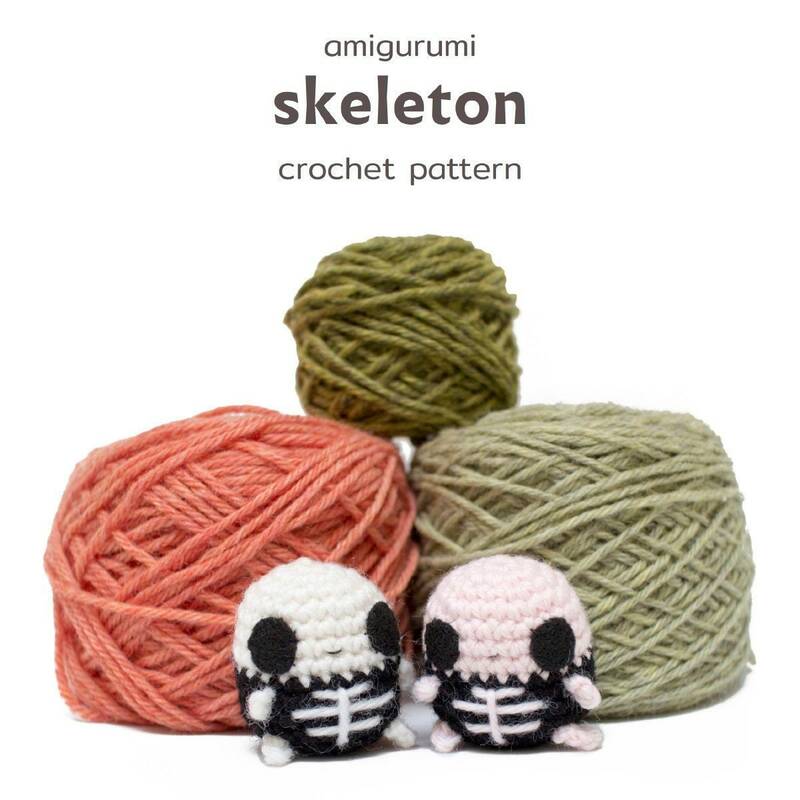 A downloadable crochet pattern to make your own amigurumi skeleton. 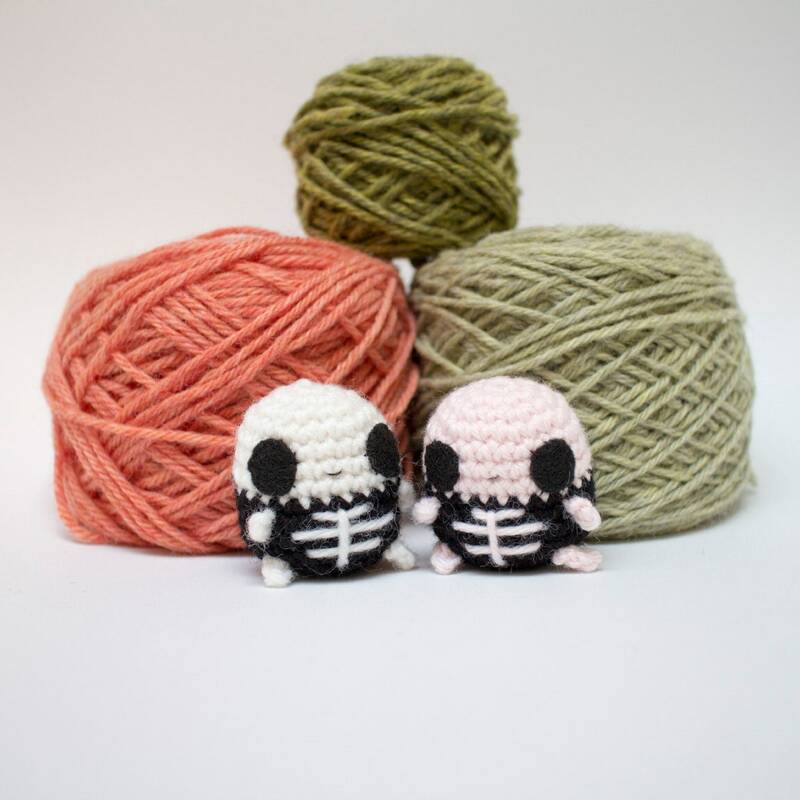 The pdf file includes a written crochet skeleton pattern (US crochet terms), crochet charts, step-by-step photos, and detailed assembly instructions. A printer-friendly version with fewer photos is included. You'll also get a copy of our beginner's crochet guide, which teaches you some basic techniques used to make amigurumi. The guide has left-hand and right-hand versions. 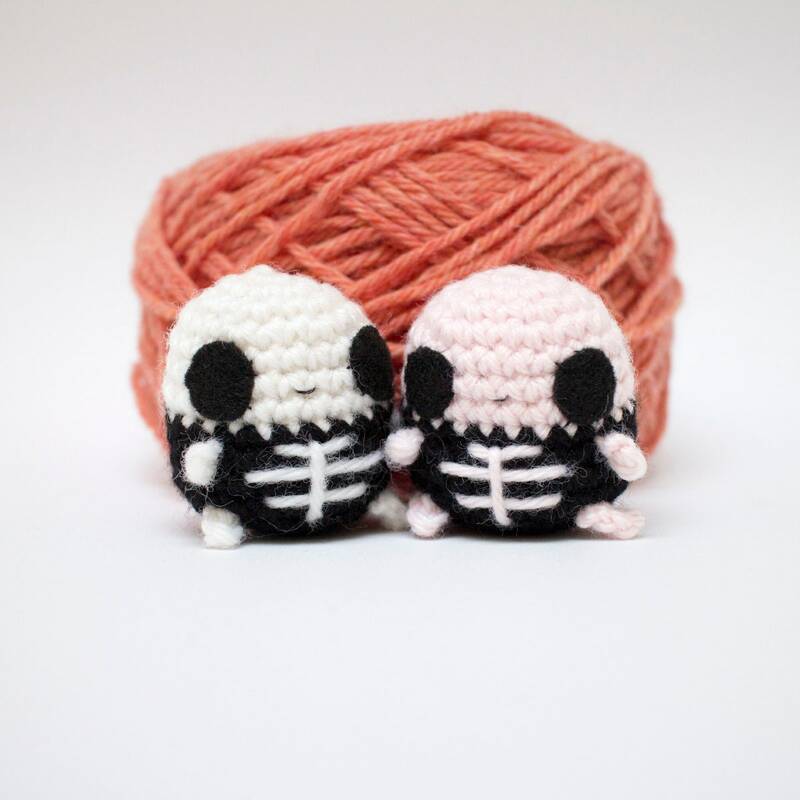 These mini amigurumi skeletons can be used as little gifts or cute crochet Halloween decorations. This is an easy amigurumi pattern, using single crochet stitches in the round. The required crochet techniques are taught in the beginner's guide included with your purchase. 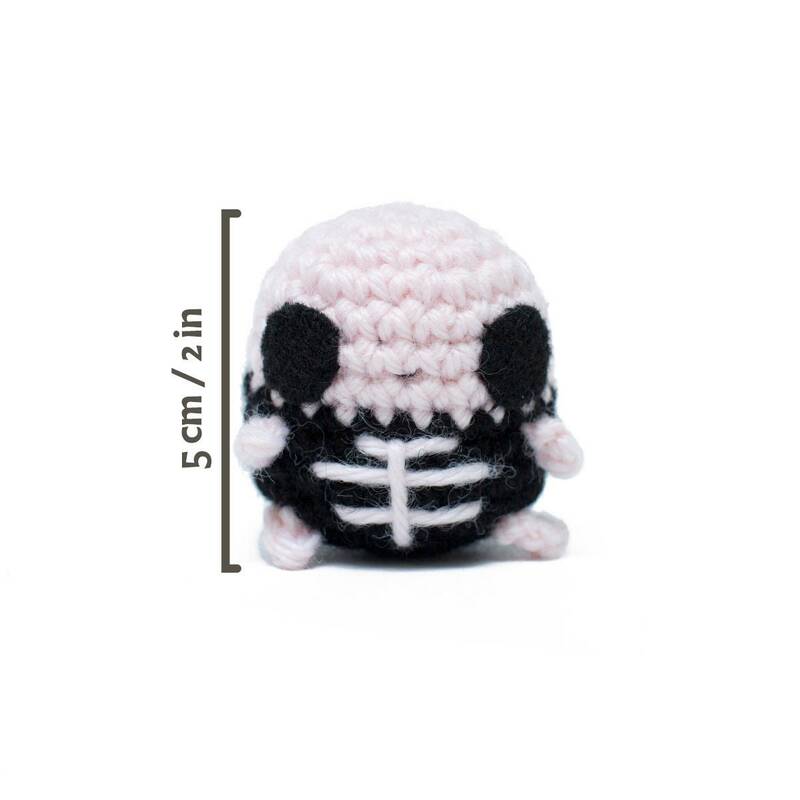 Using medium (worsted) weight yarn and a 3.5mm (E) crochet hook, your skeleton will be about 5 cm (2 in) tall. However, exact gauge is not important for this project, and you can adjust the size by using thicker or thinner yarn. After your payment is processed, Etsy will send an automatic notification telling you that the pattern is ready on your Downloads page. You can then download it directly from your account. An email address is included in the file, so you can contact me any time for pattern help. Móhu's amigurumi patterns are intended for personal use. The copyright remains the property of Móhu. You may not distribute the pattern, or altered versions of the pattern, whether in physical or digital form. 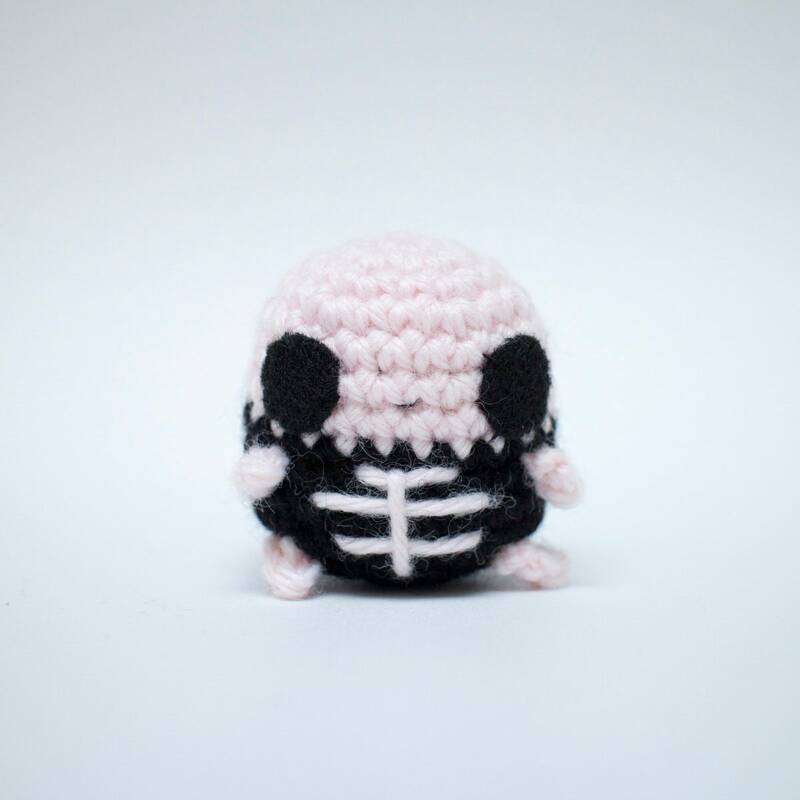 You may sell amigurumi made from this pattern, as long as you credit Móhu as the designer. More details are given at the end of the pattern. • Service providers. I engage certain trusted third parties to perform functions and provide services to my shop, such as delivery companies like Canada Post. I will share your personal information with these third parties, but only to the extent necessary to perform these services. • Business transfers. If I sell or merge my business, I may disclose your information as part of that transaction, only to the extent permitted by law. • Compliance with laws. I may collect, use, retain, and share your information if I have a good faith belief that it is reasonably necessary to: (a) respond to legal process or to government requests; (b) enforce my agreements, terms and policies; (c) prevent, investigate, and address fraud and other illegal activity, security, or technical issues; or (d) protect the rights, property, and safety of my customers, or others. I may store and process your information through third-party hosting services in the US and other jurisdictions. As a result, I may transfer your personal information to a jurisdiction with different data protection and government surveillance laws than your jurisdiction. If I am deemed to transfer information about you outside of the EU, I rely on Privacy Shield as the legal basis for the transfer, and use Dropbox which is is Privacy Shield certified. • Access. You may have the right to access and receive a copy of the personal information I hold about you by contacting me using the contact information below. • Change, restrict, delete. You may also have rights to change, restrict my use of, or delete your personal information. Absent exceptional circumstances (like where I am required to store data for legal reasons) I will generally delete your personal information upon request. • Object. You can object to (i) my processing of some of your information based on my legitimate interests and (ii) receiving marketing messages from me after providing your express consent to receive them. In such cases, I will delete your personal information unless I have compelling and legitimate grounds to continue using that information or if it is needed for legal reasons. • Complain. If you reside in the EU and wish to raise a concern about my use of your information (and without prejudice to any other rights you may have), you have the right to do so with your local data protection authority. 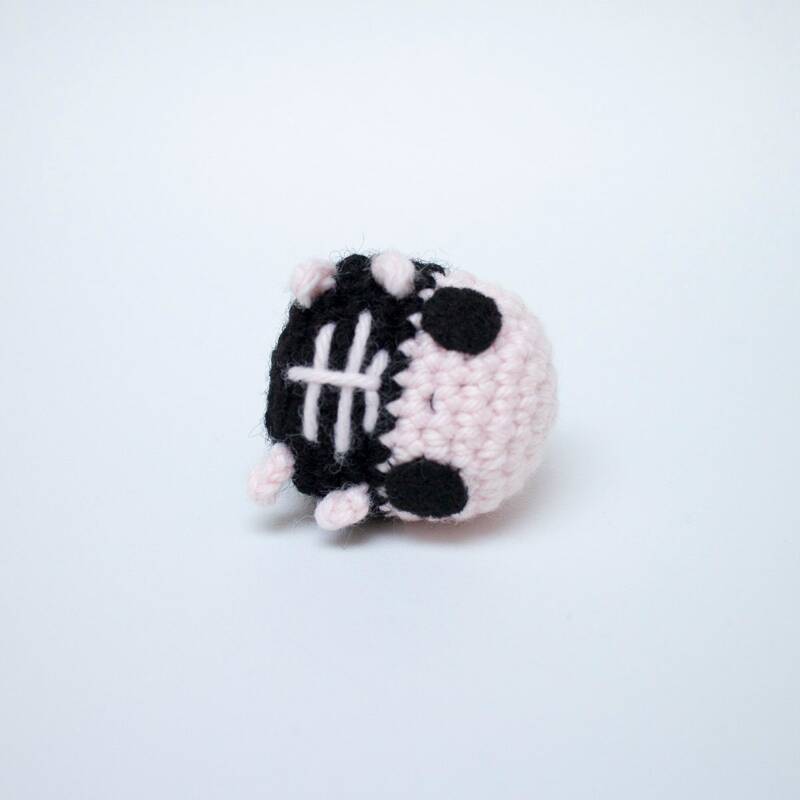 May I sell amigurumi made from Móhu patterns? You're welcome to sell items made from my patterns, as long as you credit Móhu as the designer. For online listings, add a note to each listing saying 'Made from a Móhu pattern' (or something similar). I also appreciate it if you include a link to the pattern or to my website (mohumohu.com). If you're selling in person, just add a little tag with the information on. The items you sell must be made by an individual person (no production line or mass-production). Please use your own photos to promote and sell your creations.